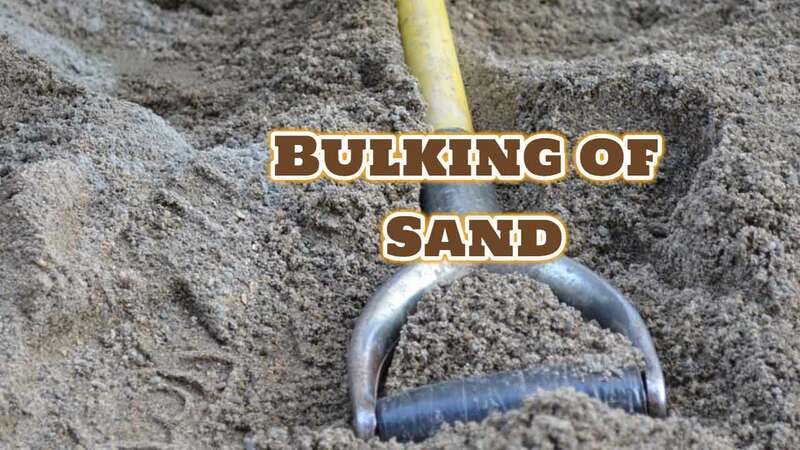 What is Bulking of Sand | Its Classification & How to Calculate it? Sand is an important construction material of natural origin, mixed with cement and lime, millions of tons of sands are used every month for construction as mortars, plasters, and concrete. The term sand is used for rock particles that range in grain size between 2 mm and 1/16 mm. In composition, they are predominantly an oxide of silica SiO2. Mineralogically, they consist mostly of broken grains of mineral Quartz (SiO2) produced as a result of the breakdown of sandstones and similar rocks. Sands are classified variously on the basis of their mode of origin, their composition, and their grain size. According to the mode of origin, sands are of three types, namely, pit sands, stream sands and marine sands. The pit sands are generally sharp and angular in outline. Winds usually deposited them and form accumulations in soils that may be covered by clays. These sands, when cleaned and washed, make good mortars. The river sands occur as accumulations of great extent along the base and banks of all the rivers in plains and semi-hilly areas. The shape of the sand grains in river sands is almost round (due to considerable transport in river waters). These are generally free from clay, salt encrustations, and organic impurities. Hence, these are the most commonly used sand for making mortars, plasters, and concrete. The marine sands occur on beaches and along the seashores. Like river sands, they consist of rounded grains of quartz. A common difficulty with these sands is that their grains are often covered with coatings of salts from sea water. These salts are not easily separable. Hence, if used in mortars or concrete, the salts react with the binding materials creating a lot of difficulties. Moreover, the salt encrustations are often hygroscopic, i.e., they absorb moisture from the atmosphere. This also results in delayed setting, dampness and efflorescence may also occur in mortar or concrete made with these sands. Hence, marine sands are considered of inferior quality and should be better avoided. When these become the only source available, marine sands must be thoroughly washed before use. According to composition, following three categories of sand are recognized in engineering fields. Clean sands: These are well-graded sand containing entirely or mostly quartz (SiO2) particles in a wide range of grain size. Silty sands: These are poorly graded sands which have a considerable proportion of silt (particle size between 0.625 to 0.075 mm) and other non-plastic fines. Clayey Sands: These are poorly graded sands having a prominent clay fraction (particle size below 1/256 mm ) and also plastic fines. Obviously, for use in making mortars, plasters, and concrete. Clean sands must only be used. Sand is also obtained artificially by crushing natural quartzite rock to the required grain size. According to grain-size, sand is classified as coarse. medium and fine sand : 2 – 1 mm, 1 – 0.25 mm, 0.25-0.15 mm, respectively. Bulking of sand is an important volumetric change that takes place in sands when they are moist. Sands increase in volume, to the extent of 20-30 percent, when they contain moisture between 2-8 percent. This is because moisture in small proportions forms thin films around the sand grains. Fine sands bulk greater than coarse sand. When the moisture content is increased beyond 8-10 percent, the bulking of sand effect almost disappears. In fact, sand grains settled in a water tank will have the same volume as dry sand. The quality of sand is determined concerning its clay content, contamination with organic impurities and its salt encrustations. Good quality sands should be free from all these impurities. It is established that volume of sand will be more when water is present in it even in small quantities. In other words, two batches of sand, one dry and one moist, that may have the same weight, will have different volumes. The volume of moist sand will be more than that of dry sand. 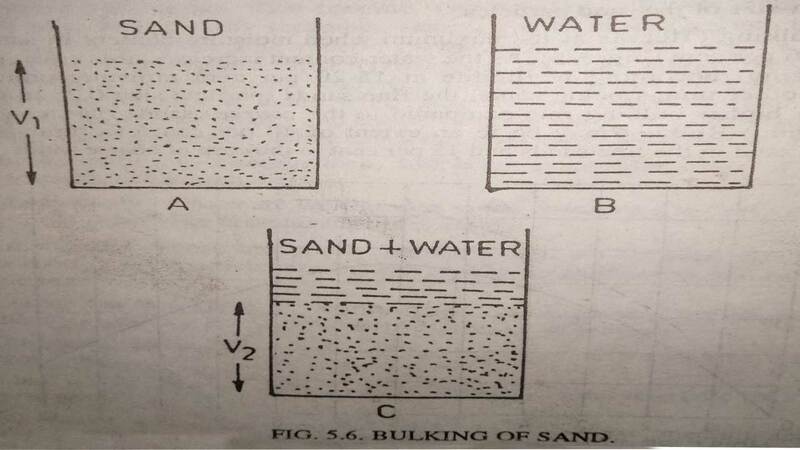 This change (increase) in the volume of sands on getting moist is termed as bulking of sand. Full knowledge of bulking of sand is necessary for a construction engineer because sand is sometimes used for mortars, plasters, and concrete by volume. All the mix designs denote the proportion of sand is essentially in the dry state. As such if this fact is ignored and sand in wet condition is added to the cement or lime, the resulting mortar will be containing a lesser amount of sand than the required amount. Hence, a correction factor for bulking of sand has to be applied alter-determining the rate of bulking for the sand to be used in mortar and concrete making. As regards the rate of bulking of sand, it has been observed that it is related to two factors. (i) percentage of moisture content in the sand. (ii) gram-Size of the sand particles. Thus, bulking effect is maximum when moisture content in the sand is between 4-6 percent. 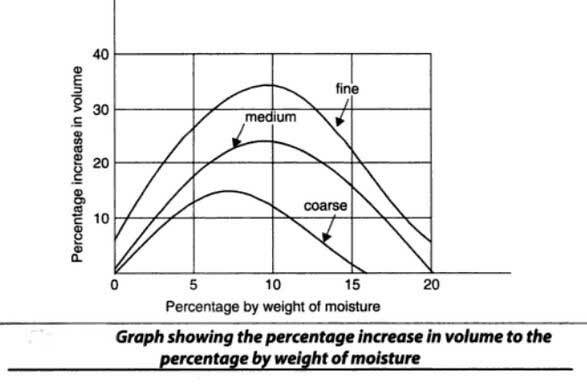 As the water-content increases, this effect goes on decreasing, becoming negligible at 15-20 per cent moisture content. Similarly, other things being same, the fine sands (particle size 0.25 to 0.15 mm) show higher bulking rate as compared to the coarse sands (particle size around 2 mm). Bulking may be to the extent of 40 percent of the original dry volume of sand in the fine and 15 percent in the case of coarse sands. (Step-1): Take a clean glass cylinder and fill it about 3/4 with the sand sample. Then, Note down its volume. Let’s Say; it’s Volume = V1= is 30 cm3. (Step-2): Now carefully take the sand out and place it on a glass plate. Fill the glass cylinder with water to 3/4 of its volume. (Step-3): Put the sand sample back into the glass cylinder very slowly, Stirring the water while adding sand into it. This is essential to make all the sand grains settle fully in the cylinder. Note down the new volume of sand sample Let it be V2. (If V2 = V1 , it means that the sand samples has retained to its original volume, i.e., it has shown no bulking). But Let’s say in another case V = 24 cm. Then bulking of sand sample will be: V1-V2/V1 x 100. Now just put the values of V1 = 30 cm3 and V2 = 24 cm3. So, Now 30-24/30 x 100 => 6/30 x 100 => 20%. So, this means that 20% of bulking of sand has taken place. I hope that this article will help you. If you have any questions, suggestions, Please, Let me Know in the below comment section. I’ll be glad to help you. Thanks! Don’t Forget to share it. Sharing is Caring.